So, which is it? 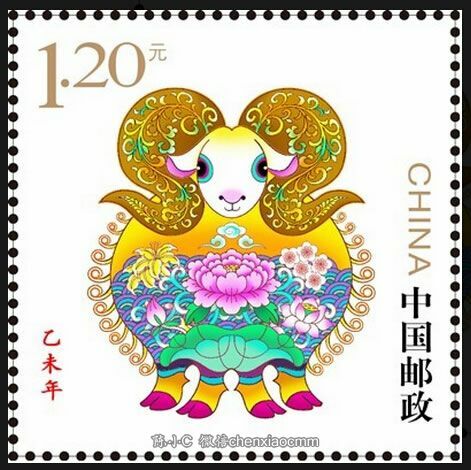 Is 2015 the Year of the Goat? 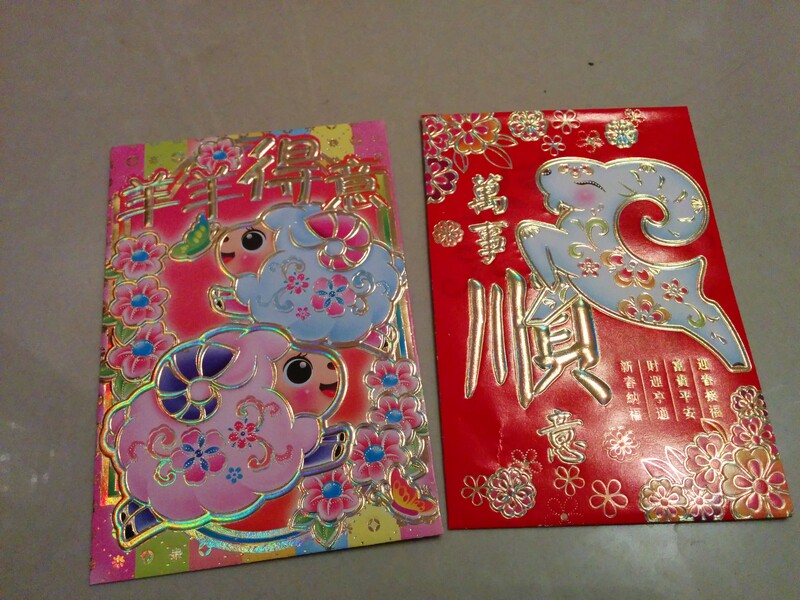 Year of the Sheep? Year of the Ram? I’ve had several people ask me, and the answer is easy: it’s all of them. For an interesting and well-written explanation on this, plus a fascinating discussion in the comments, see Year of the Ovicaprid. Fair warning: I have a degree in linguistics. What is “interesting” and “fascinating” to me might be “incomprehensible” and “nerd-fest” to you. 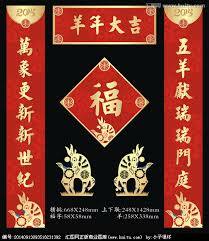 Since 羊 is ambiguous in Chinese, both goats and sheep get portrayed for New Year’s decorations and paraphernalia. Here’s a sample. 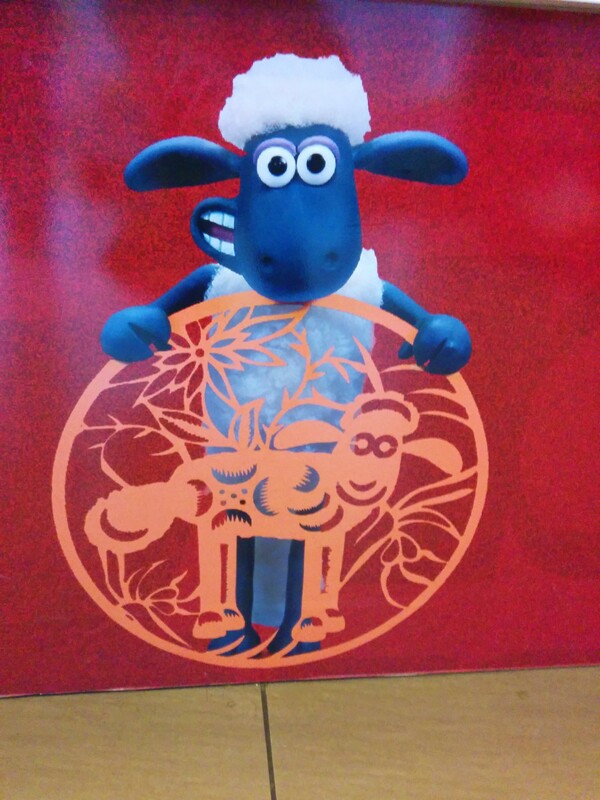 We knew we’d be seeing a lot of this guy, the most famous sheep in all of China, 喜羊羊. Actually, I always thought he was a sheep, but it recently dawned on me that he does in fact have horns, plus, the English name of the cartoon is Pleasant Goat and Big Big Wolf, so, I guess he’s on Team Goat. …but McDonald’s went with Shaun the Sheep. 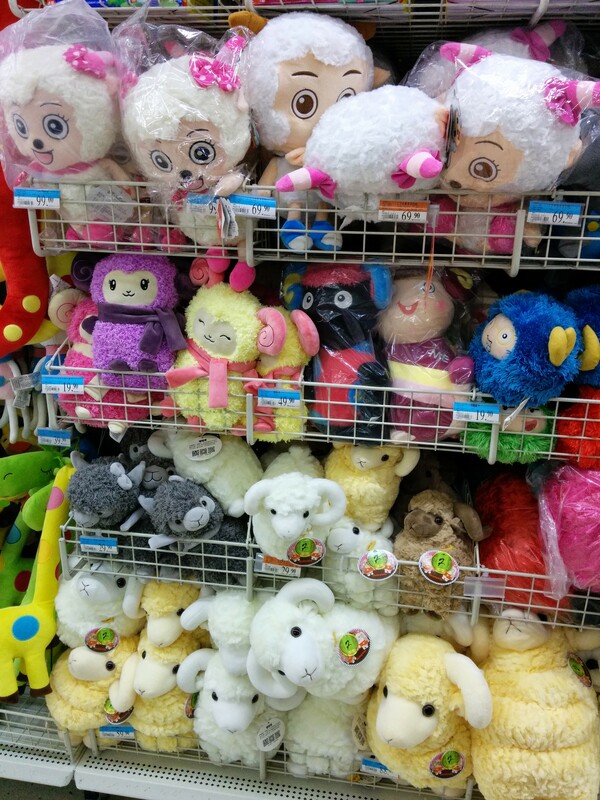 Here’s a plethora of sheep toys at Walmart. Plus 喜羊羊’s friend 美羊羊 whom I now suspect is also a goat. 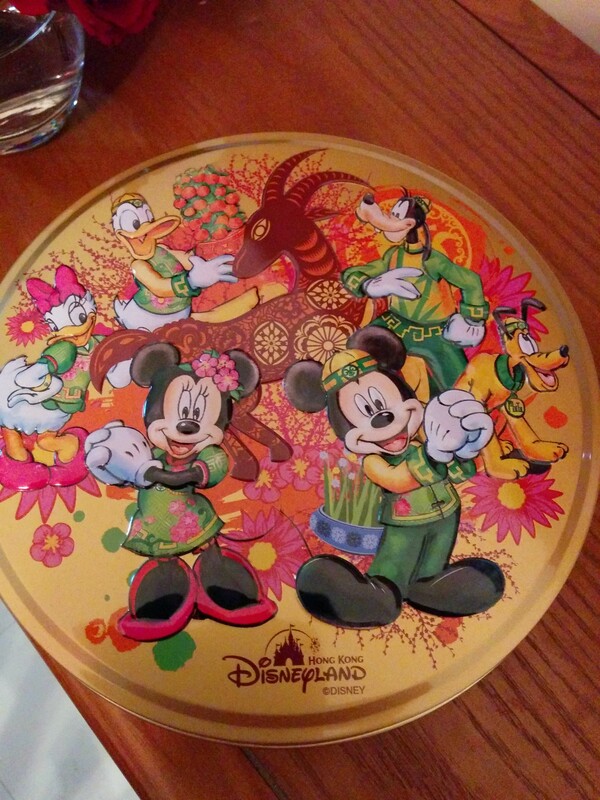 The hongbao manufacturers couldn’t decide. 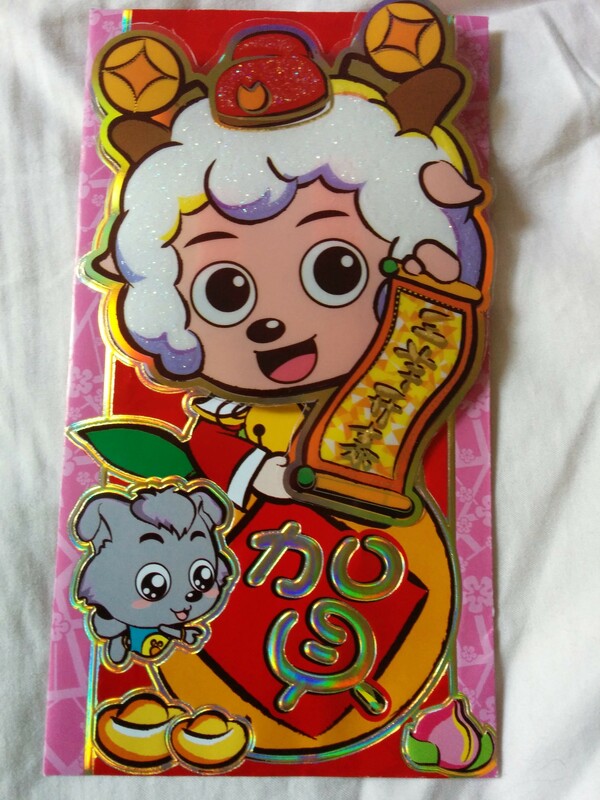 Door decorations were available in both; here’s a goat set. Whether you choose goat or sheep, it’s apparently not a very lucky zodiac animal. Those who are superstitious tried to make sure their babies were born a few weeks ago, during Year of the Horse. We’ve heard that couples are also waiting to have a baby next year so that their child will be smart and clever since it will be Year of the Monkey. I’ll leave you with a special Year of the Goat-Ram-Sheep greeting that I found here. and be free from worries. and be happy every day! All photos copyright smalltownlaowai except: goat 2015 (hkfengshui.com), stamp (blog.sina.com.cn), papercut (58pic.com), door decorations (huitu.com).